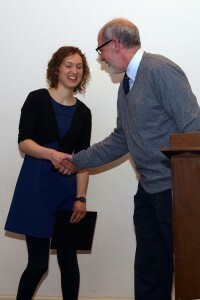 Leah Uecker receives the Ruth I. Walker Undergraduate Tuition Award. 2019 Biological Sciences Scholarships and Awards – Call for Applications: Applications can be downloaded here. Deadline for applications is 12:00pm NOON, February 8, 2019. The Department of Biological Sciences awards 25-30 scholarships each year to undergraduate and graduate biology students totaling more than $25,000. Recipients of these scholarships are honored during the annual departmental awards ceremony that is usually held in Spring. For additional information and application material, we encourage you to check the biology home page periodically for announcements. We also email students periodically with information regarding scholarships and awards, so it is important to check your UWM email account regularly. Undergraduate (junior standing or above) and graduate students in Animal Biology. Minimum GPA = 3.25. James D. Anthony, a graduate of the University of Michigan, joined UWM in 1954 as professor of zoology. In addition to teaching and research in parasitology, Dr. Anthony chaired the Zoology Department for three years and was involved in the Medical Technology Program. Dr. Anthony was politically active in local government and served as Menomonee Falls trustee for ten years and as village president for four. Dr. Anthony passed away in 1976. Joseph G. Baier began teaching at the former University of Wisconsin Extension Center in 1932 and played a major role in the merger of the Center and Wisconsin State College to form UWM. As the first Dean of the UWM College of Letters and Science, Dr. Baier was instrumental in the construction of Lapham Hall. Undergraduate students (junior standing or above) conducting research in Botany are eligible. Professor Robert Costello (1921-2001) was an active member of the Department of Botany (merged with Biological Sciences) at UWM from 1956 until his retirement in 1986. During his tenure, Dr. Costello helped develop the honors program and authored a widely used botany laboratory manual. He is remembered for his service to the community, his excellence as an educator, and his personal warmth. This award is made possible through a generous donation from Paula J. Thompson, a 1968 alumna of the Biological Sciences Department. Undergraduate (junior standing or above) and graduate students conducting research in Botany are eligible. Ray Hatcher was an Illinois native who received his Ph.D. at the University of Cincinnati in 1959 and shortly thereafter joined UWM as an assistant professor in the Department of Botany. His research specialty was bryophytes and he traveled widely in the United States, New Zealand, and South America, to collect specimens. Dr. Hatcher contributed to the planning and establishment of the UWM graduate program in Botany. Dr. Hatcher was also a gifted musician who played violin and guitar. Dr. Hatcher died very unexpectedly in 1967 at the age of 36. This award is given to undergraduates (junior standing or above) in Conservation and Environmental Studies. The Hutto-Erdmann Conservation Scholarship has been offered to undergraduate students in conservation and environmental studies since 1972, when the Aldo Leopold Conservation Club provided an initial endowment in memory of Neville B. Hutto and Jerry W. Erdmann. The fund has been augmented by additional donations over the years. Undergraduates (junior standing or above) and graduate students in Biological Sciences. Minimum GPA = 3.25. Dr. James J. Magnino was a family practitioner in the Kenosha area who received his B.S. in Zoology from the University of Wisconsin-Milwaukee. Despite relocating to other areas of the Midwest, Dr. Magnino remained connected to UWM. He was compelled to create a scholarship fund in honor of his two favorite professors – Dr. Joseph Baier (Biological Sciences) and Dr. Peter Kovacic (Biochemistry). This award is given to students conducting research in Limnology or Related Sciences with high academic achievement, with a preference for graduate students. Clifford Mortimer was appointed Distinguished Professor of Zoology at UWM, as well as Director of the Center for Great Lakes Studies, a position he held until 1976. Dr. Mortimer’s research focused on physical limnology and lake hydrodynamics. At the age of 94, he published a book, Lake Michigan in Motion, the royalties from which help to support this award. Awarded to a female graduate student who is a Wisconsin resident, in good standing, and is actively engaged in coursework or research while making progress toward degree completion. Louise Julia Neitge (1905-2004) was born on a farm in northwest Wisconsin. She set her sights on enrolling at the University of Wisconsin in Madison, where she majored in zoology. In 1927 she was offered the opportunity to pursue graduate study, but needed to pay her debts and cover other living expenses. Louise went on to become a high school teacher in Viroqua, Wisconsin. In 2005 her daughter, Carmen Mather Witt, UWM Dean of Students from 1979-1996, established this scholarship in her mother’s name to ensure that Wisconsin women could follow her mother’s dreams in the study of biology at the graduate level. Awarded to undergraduate and graduate students who are pursuing the study of plant sciences. This gift is made in honor and memory of UWM Professor Emeritus Peter J. Salamun (1919-2014). Born in 1919 in Lacrosse, Wisconsin, to Peter and Mildred Salamun, Peter graduated high school (1937) and Milwaukee State Teachers College later renamed UW-Milwaukee (1941). He enlisted in the U.S. Army in 1941 and was assigned to the Eleventh Air Corp as a Weather Observer stationed in Alaska where he helped in the planning of combat missions in the Pacific Theater. Post-war, Peter continued his education at UW-Madison earning his Masters (1947) and Ph.D. (1950). A professor and Chairman of the Botany Department at UW-Milwaukee, he retired after 36 years of service. His students work as secondary and university educators, naturalists, researchers and municipal horticulturalists across the nation. Professor Salamun was instrumental in developing the UW Field Station at the Saukville Bog Area. He was also a founding member of the Wisconsin chapter of the Nature Conservancy, and a published authority on the flora and geology of the Great Lakes. The Salamun Fund was made possible by generous donations from the Salamun family, primarily the family matriarch, Lorraine Salamun. Tuition scholarships to continuing undergraduates majoring in Biological Sciences or Environmental Sciences. Awards to graduating seniors majoring in Biological Sciences or Environmental Sciences based on overall scholarship and/or an independent study projects. Grants-in-Aid for graduate or undergraduate students to pursue their academic or research activities. A native of Michigan, Ruth Walker earned her Doctor of Philosophy degree at the University of Wisconsin-Madison in 1926. She came to Milwaukee in 1931 as an botany instructor at the former University of Wisconsin Extension Center. Following the merger of the Milwaukee Extension and Wisconsin State College, which created UWM in 1956, Dr. Walker served as Chair of the Botany Department until 1960. Throughout her career, Dr. Walker was devoted to teaching, research, and service to the University. She was internationally recognized for her research in cytology and embryo development. Upon her death in 1962, friends and colleagues established the Ruth I. Walker Memorial Scholarship Fund. In 1990, the Walker Fund was significantly enhanced by a gift from the estate of her sister, Jessie M. Walker. Information about the awards can be obtained from the Department of Biological Sciences office in Lapham Hall S181. Please revisit this page for dates and application forms.